The song was published by the late Seán O'Shea of the Kerry Studios and is used here by kind permission of his daughter Barbara Cassidy. Seán wrote, "This old building, erected on a site given free to the people by the O'Connell family, was first known as the Temperance Rooms. It was later used as Reading Rooms and as a rendezvous for Young Irelanders while in the famine years it became an Auxiliary Workhouse. It came later into the possession of Dr. Barry whose legendary generosity to his famine-stricken countrymen is still remembered. He it was who donated it to the Christian Brothers for use as a school when they came to Cahersiveen on the 2nd February 1860. Demolished in October 1969 it has been replaced by a new building". In recent years the building and site has been acquired by Kerry County Council and now houses the Cahersiveen Public Library. Schooldays and the friends of youth are common themes in Sigerson's work. 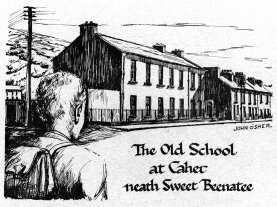 With the old school of Caher 'neath sweet Beenatee. May their names live forever 'neath sweet Beenatee. In the roll of the old school 'neath sweet Beenatee. They were giants in the old school 'neath sweet Beenatee. O goodbye and God keep you my sweet Beenatee. And then the Master and hawk swooping out of the blue sky together. And you wiped the chalk from your hand and wished me joy. Now the harsh old world has broken its cane on our backs.